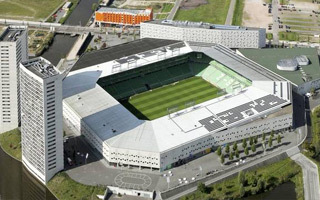 From July 1 onwards, Euroborg in Groningen will officially be named Noordlease Stadion. It’s the first naming rights deal in the stadium’s 10-year history. The client isn’t that new, Noordlease used to be FC Groningen’s main sponsor for a few years. The deal will be in force for 6 years and Noordlease pledged to support the club’s plan to launch a club museum, currently known as FC Groningen Experience. However, yesterday’s announcement wasn’t welcomed too well by fans. Official supporter association of FC Groningen released an open letter, expressing the disappointment. Not as much with naming rights altogether, but with how their club handled it. Fans were not informed of anything, while Noordlease was previously presented as saviours of the FCG Experience scheme, which many fans understood as selfless help to this cultural initiative. Now it’s clearly part of a larger sponsorship contract. Today unknown perpetrators hanged cutout faces of general director Hans Nijland with €-signs instead of eyes. Below each cutout was a moneybag, suggesting the official to be a ‘sellout’.